When I first started food blogging I felt like an island. My blog was this tiny little thing in the middle of the sea and no one even knew I was there. Part of me was operating on a build it and they will come mentality (probably out of self preservation) and part of me was wondering what the heck I was doing wrong. Looking back I don’t necessarily thing I was doing anything wrong, I just wasn’t doing enough right. ‘Built it and they will come’ is only part of the equation when it comes to building a blog (or business of any kind). When applied to business the saying should really be built it, promote the heck out of it, and then they will come. If you’re not doing everything you can do get people to stop and look then why would anyone bother? It’s not that I didn’t know that I needed to share my blog everywhere, I just didn’t know where to go. Other than Pinterest I was completely clueless. It was months before I even realized that Food Gawker was a thing, but at that point my photography was so bad I didn’t have an icebergs’ chance in hell of getting anything accepted. 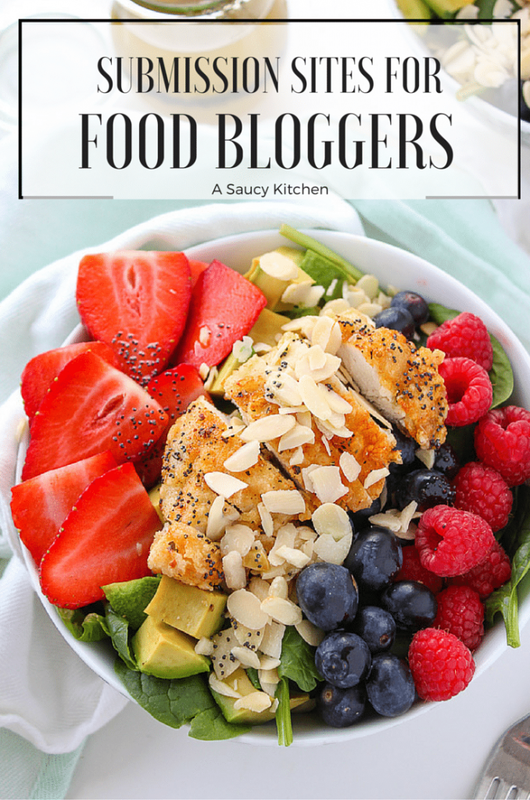 Eventually I found myself creeping around The Food Blogger Pro (<—affiliate link!) community forums which opened my eyes to all of the different places that I could share recipes. Little by little my photography improved, my list of submission sites grew, and people started to come to my blog. photograzing sites: what are they? Think Pinterest but for food and smaller photos! Food Submission sites are websites that rely on community contribution from bloggers. They share a thumbnail sized picture of your recipe, the name, and a link back to your blog. Sites like Buzz Feed and the Huffington Post are also known to visit these sites when looking for recipes to include in their recipe roundups. Foodista is another great site that you should check out. They have daily features for “Food Blogger of the Day” & “Drink Blogger of the Day”. You can submit your own blog to be considered through the contact form for a chance to be featured which means that your blog will be shared on their Facebook page (over 260,000 likes so far) and a link on their blog which is always helpful for SEO. I recommend keeping an eye on your Google Analytics to see where your traffic is coming from so that you can focus on submitting to those sites. When I was only getting a few thousand page views a month I submitted to as many as I could for a few extra page views – back then 10 clicks from Food Spreading meant a lot. Now that I’m getting significantly more traffic I have narrowed down my list to submitting to the sites that send me the most traffic so that I can focus more time on creating content that is worth sharing. On average it takes me about 30-45 minutes to submit my photos. It’s incredibly tedious work, but it’s easy. I’d recommend sitting down with a cup or coffee/tea, putting on some music and just powering through. Also, don’t forget sites likes Pinterest, Yummly, Flipboard, and Facebook are great for sharing content! If you’re anything like me self promotion doesn’t come naturally, but it’s necessary if you want to grow your blog and spread your message. What about you? Where are your favorite places to share blog posts and connect with other bloggers? Leave me a comment below if you have anything you’d like added to the list! Thank you so much for this extremely informative content! My site is very new. I have been doing a lot of research on how to get my site noticed and increase traffic. Most articles all repeat the same information, but yours had fresh ideas and tips and you keep on giving more helpful tips in the comments section. I really appreciate it! Thanks Emily! I’m really glad it can be helpful to people! When I was first starting out everything felt so overwhelming! Thanks for sharing this article. I have been looking endlessly for articles suggesting how to get more traffic, and have started using few of the things suggested by you. I submit my recipes on food gawker, and promote my blog through pinterest and Instagram. I started my blog a year ago, but theres hardly any traffic. I get more spam comments , than any actual comments. Not sure what i’m doing wrong, or in your words ‘not doing right ‘. Im completely lost.Any more suggestions from you are welcome.Will surely try using other platforms as suggested by you :)Hope that will help. Your food photography is extremely appetising and you have a lot of step by step photos which is great! One thing I noticed though is that when I try to pin something from a recipe all of the photos you have show up as available to pin which can make it harder for your recipes to gain traction on pinterest. If you’re operating on wordpress.org you might want to look into finding a social sharing plugin to help with this (this podcast can probably explain it far better than I can). I’d focus on just looking into those things for now so as not to get too overwhelmed. If you have any more questions though just let me know! Also I LOVE the outfit you’re wearing on your about me page! Thanks so much for taking out time, checking my blog, and giving me the feedback. This means a lot to me . I have joined all the groups you suggested . It’s just been a day, but i can really see there is soooooooo much to learn from these groups. I wouldn’t have known about these had i not stumbled upon this amazingly helpful post of yours. Is it possible to give the podcast link you are talking about above. i can’t seem to find it. Glad it could be helpful! Thank you so much for sharing this with us Sarah! I’ll definitely try out at least some of these recipe websites. This is so helpful! I am going to sit down and check out all these tonight. Thank you for putting together this list! Thanks Stephanie! Hope it’s helpful to you! So helpful and nice to have them all in one place. THANK YOU! I have been getting some traffic from Pinterest and IG, but I think it’s time to get my recipe ideas and photos in front of the people who need it the most – super duper busy families who can hopefully benefit! BTW – I love your site! Any advice that you can provide which would help with my site would be greatly appreciated. So glad it’s been helpful! If you haven’t already seen in my other comments I highly recommend joining this group on Facebook called Food Bloggers Central -https://www.facebook.com/groups/foodbloggerscentral/ When I first started getting serious with my blog that group is really the major catalyst that got things going. There are a TON of useful resources and people who are always ready and willing to answer questions. Once you’ve joined that I recommend listing to a few food blogger podcasts. 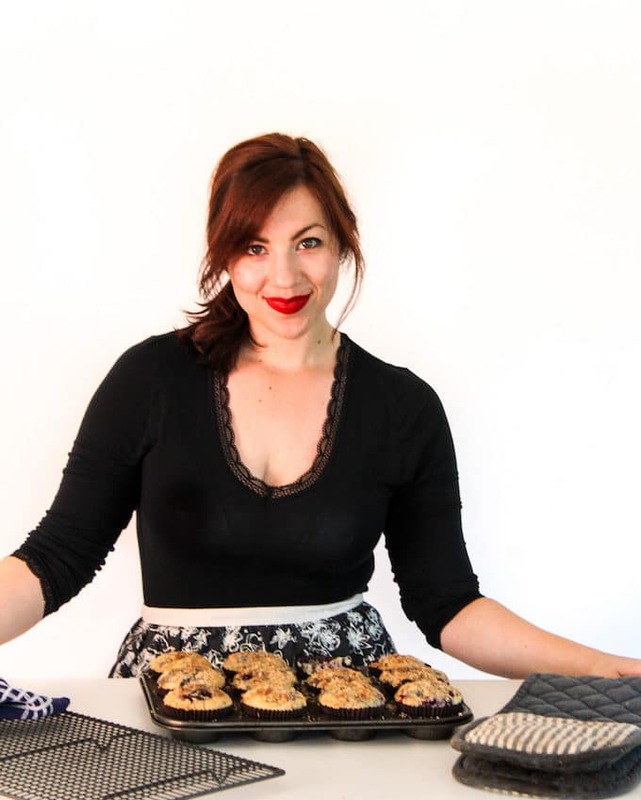 My favourites are Food Blogger Pro (from the folks over at Pinch of Yum) https://www.foodbloggerpro.com/blog/category/podcast/ & Chopped Podcast https://chopped.academy/category/podcast/ These are great for deep diving into individual topics and staying inspired. As for advice – I think the thing to keep in mind is to always think of who your audience is when coming up with and wring out your recipes. What do busy people who cook for families (usually moms) want in a recipe and how would they want to see that recipe. The best advice I was given is to try to answer questions before your readers have to ask for them. If you write about cauliflower rice explain in the post where they can buy it, or maybe link to the types of tools that you used when cooking. If you always keep your ideal reader in mind and try to cater that them you’ll always be ok. It’s kind of a slow burn as far as growth goes but it’s the most sustainable and will pay off the most long term. I hope that helps! If you have any more questions feel free to come back or shoot me an email! Thanks so much for all this information. It’s all very helpful; really appreciate that you took the time to share with your community. I just started the journey a little while ago and the article and links in the comments are great resources. Glad it was helpful! Good luck with your journey! Just checked out your insta btw and I love your photography style! Hi Ashiq! While it is bad practice for those websites to not have converted their URL’s from http to https (that’s why they’re showing up as insecure) it shouldn’t actually be a problem here. It’s mostly just important to use https based sites when you’re making purchased or dealing with money. That being said I totally understand if you don’t want to visit sites like that at all! Thank you Sarah. I will check them again. Thank you for sharing this information I’m so happy, I am currently starting my own blog, and make it public. That’s so exciting! I love your blog name – that’s so fun! This list is AMAZING!! I just started my blog a few months ago and getting traction and people to my blog has been so frustrating. Thank you for sharing your knowledge and experience!!! I can’t wait to submit some stuff! Thanks Lyn! If you haven’t already you should definitely join https://www.facebook.com/groups/foodbloggerscentralsocialsharing/ It’s got so much great/current info – if you’re new to the blogging world you’ll really enjoy it! First time here, this is defenetly great information to know especially in the beginning stages of blogging. I started my blog two month ago 😀 and although it’s fun it can feel overwhelming sometimes. It’s great to find bloggers like you who provides so much value. Thank you 👍. Any advice on what should I focus the most in my beginning stages? It’s a really great resource full of thousands of bloggers all coming together, asking questions, sharing ideas, etc. Also I recommend subscribing to this podcast from Food Blogger Pro: https://www.foodbloggerpro.com/blog/category/podcast/ They have so many great interviews that are just as inspiring as they are informative. And finally start watching these youtube videos about food photography from this channel: https://www.youtube.com/channel/UCsM3clfP0vfMFlnf2tde41A She’s got really great, informative videos that I still refer back to all the time. In fact in the beginning stages of a blog I do think that improving your photography will make the biggest difference. It wasn’t until I started working really hard on my food photography that I noticed that my blog traffic started to grow. Hopefully that’s all helpful and not still totally overwhelming. If you ever have any questions feel free to email me or send another comment! Thank you so much for sharing such a valuable information, I was looking for a long time. I am so happy, at last, I found it on your blog. Glad you’ve found it helpful! FYI – the link to dessert stalking just infected my computer with a search engine redirect virus. They have not updated their FB page since 2016. You may want to consider removing it from the list. Oh no! Thanks for letting me know – I just removed it. So sorry that happened to you! Hi. Im a Canadian foodie and YouTuber. I dont cook myself. I review snacks and food products on my channel http://www.youtube.com/dgtronic . Would you happen to know any blogs or sites that I can submit my videos to? Hey Paula! I’m so glad it’s been helpful to you! I can still very much remember how difficult it was getting everything off the ground when I first started my blog – there was nothing but crickets for what felt like aaaaages! Just as long as you keep at it things will get easier! This was so helpful, thanks a million. Are these sites just for being able to post your recipes? My food blog is a little bit different. It’s not about recipes (although there are some recipes on there). I want to be able to advertise blog posts and other resources from the blog. Hi Michelle! These are really aimed towards sharing recipes but there are a few other options that might be better for those types of things! Pinterest of course is good for almost anything, but stumbleupon and flipbook might be something to look into. It’s hard for posts to take off with those platforms but when they do it helps! If you haven’t already I’d also recommend joining this facebook group: https://www.facebook.com/groups/foodbloggerscentral/ There are a few thousand members of people with all sorts of food blogs – it’s just a really great place to get advice from people who might have more specific recommendations for what you need! Great resourceSarah! I actually do SEO and digital marketing for a living, but when I’m looking to link build for most of my customers, it’s local citations or national companies like Thumbtack, all of which I’m known as an expert in for helping clients. 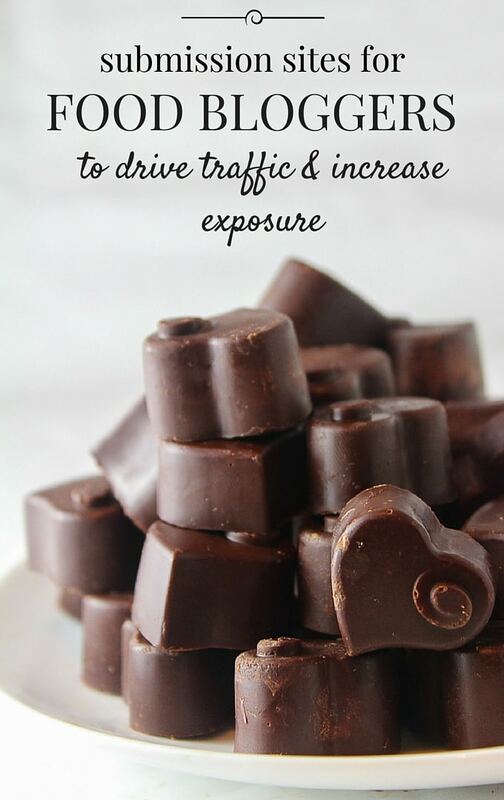 BUT, for bloggers – especially food bloggers – I’ve been hitting the mark on link building. Thank you for these resources, I’m hoping the time spent with them are definitely worth the effort. Thanks Kasy! I hope they’re as useful to you and your clients as they have been to me! This was super helpful Sarah, so thank you!! I had no idea there were so many sites like this so will have to begin playing around with them. These types of things really helped me when I was first starting out – glad I can share! Thanks for a great article, saved a tone of time for me! I used to have a healthy food blog back at student times, I wish I could have found your article back then! Thanks once again and continue the great job! Hi Lili! Glad you found this helpful! Thank you for such inspiring article. I want to transform my blog to a recipe one. I already get like 60k views from search engines. I just published my first recipe but my photos are away to be any good. Is still worth submitting to websites if my photos are still at the beginner level? Absolutely! A lot of these submission sites aren’t moderated so any/all photos will be accepted. Some of the larger ones like foodgawker are pretty picky, but it’s always a fun way to measure progress when your first photo gets accepted! They also provide a little feedback on why a photo may not have been accepted. That feedback was helpful to me when I first started. They’ll just say something like “poor lighting”, “awkward angle”. “composition” etc. You can always try it out for a week or two to see if it’s worth your time. If it doesn’t look like you’re getting much through you can always give it a break until you feel like your photos have improved. Good luck! 60K is great – as long as you stick with it you’ll keep growing! Thanks for the tips! I’ve been a food blogger for three years but some I’d never heard of, like Food Yub which is bringing in tons of traffic! Glad it was helpful! I stopped submitting to most of these after awhile because it takes so much time but I love food yub – sends so much traffic! Thanks for sharing and informative list with us. As all the list consist of many different and unique kind of dishes And all the dishes are mouth watering. Thank you. Best regards. This is so great. But some links don’t work anymore. For example – foodfotogallery.com is completely dead. Your should remove it. Thanks for the comprehensive list! It is very helpful to be honest! Thank you for sharing this useful information! Your first paragraph described exactly what I feel at this moment. I started my food blog 3 weeks ago and I’m struggling with finding ways to make my voices heard. I will try to submit photos to those websites. I’m still in the process of learning how to take good food photos though. There are just so many things to learn and I knew nothing about those things before starting my blog. I’m still not sure how to promote my blog, how to make use of Pinterest to reach potential readers, etc., but I know this is still the beginning and having a food blog has been an amazing experience for me. I feel encouraged after reading your blog post. Thanks again. Hi Sophie! First of all – I LOVE your blog! Vietnamese cuisine is probably my favourite type so I’m excited to try some of your recipes! Second – congrats on starting your blog! That is so exciting and for 3 weeks in it’s already looking fantastic! My first 8 months of posts were pretty terrible so you’re on a much better foot than I was 🙂 I think the thing to keep in mind is that things are going to take some time. I didn’t really see any traction in the first 6 months of blogging and that’s pretty typical for the majority of people. I was so clueless until I found/joined that group & I have learned SO MUCH. The people are really friendly and I’m constantly learning new things. If you’re into podcasts look up the Food Blogger Pro Podcast & The Chopped Podcast. I really love listening to those because they both get into the nitty gritty of growing a blog. It’s also really nice to hear that everyone is going through the same struggles. Again, I’ve learned so much for both of those. Can’t recommend them enough. Thank you so much for your kind words. I’m also glad to hear that Vietnamese cuisine is one of your favorites. I actually have to thank my husband a lot. He’s an IT guy and managed a website before, so if it hadn’t been for him, the blog would have looked much worse. However, we are both terrible at taking photos especially composition and camera angles. Your comment made me realize that we shouldn’t try to move too fast and taking it slow seems to make the journey much more enjoyable :). I did hear of the Food Bloggers Central facebook group. I filled out the form and sent a request to join a week ago but it hasn’t been approved yet, maybe all the admins are busy. I really want to join since I like so many articles on their website so I hope they’ll approve my request soon. I’ll definitely check the podcasts out. Thanks so much again and I will visit your blog regularly! Thank you for the wonderful links and resources- it made my life easy. I have been blogging for a while and was wondering how to direct readers to what I share. Hi Aarina! Thinking back on my blog growth I’d have to say improvement to my photography is what really made a difference. Until I was able to start taking better pictures my site had zero visitors. Once I started to figure out my way around a camera my pictures started to do better on Pinterest which is how to majority of people find me now. The other thing that really helped was when I joined this facebook group for food bloggers https://www.facebook.com/groups/foodbloggerscentral/ It’s been a really great resource. Everyone in there is so kind and helpful – I’ve learned so much about blogging/social media. Joining that group would be a great place to start!